A simple solution to the deficit - legalize the weed! The main problem with prohibiting drugs is that it immediately criminalize the millions of citizens who, in most cases harmlessly, use them. Also, society loses the £5 billion in revenue available through their taxation. Worse of all though, we hand this massive global trade to the black market. This hands vast wealth to criminal gangs, who are then empowered to commit far worse crimes such as arms smuggling and human trafficking. Apparently nothing makes sense in our era of catastrophic, capitalist expansion if it does not have a price tag attached and the economists have rubber stamped it. There are so many rock-solid, logical arguments for legalizing drugs it is tedious to trot them out. Luckily, a consortium of global elders and brainiacs have recently launched a concerted push to end the abhorrent cruelty of the inaccurately named 'War on Drugs'. However, the overwhelming human rights case for legalizing drugs is now also backed up by an irrefutable economic angle. 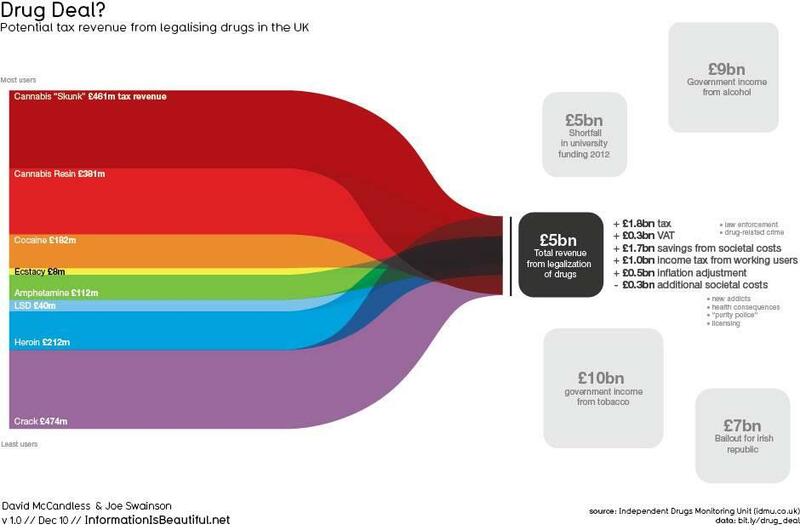 The graphic below shows how a tax on legalized drugs would help the UK economy. It is very conservative because it does not include the costs savings from reduced crime (both organized and disorganized). The myth that legalizing drugs will mean that they are used more often and by a greater proportion of society has been repeatedly disproved. In countries where narcotics have been legalized (Holland, Portugal and California) there has been no associated increase in use. There was no rise in the number of people signing with California addiction recovery centers for treatment programs. In fact, if a proportion of the tax raised is used to educate people as to the harm caused by certain drugs, then drug use is likely to decrease. The problem here for the establishment is that if you rate drugs by the harm they cause then big corporations suffer. As Professor Nutt demonstrated listing drugs by harm puts alcohol and cigarettes far above drugs like E and magic mushrooms which have many well documented positive effects with few (if any) health problems associated. What a waste! 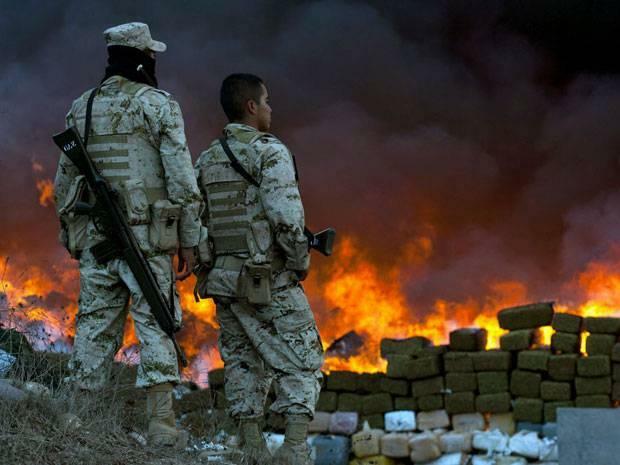 Aside from the huge costs born by society by these backwards laws, think for a moment of the vast environmental costs, and waste of resources, that result from the international War on Drugs. Think of all the fuel burnt, chemicals sprayed and resources squandered to increase the cost of a trade that will happen anyway. People have always used drugs and always will. How vain and stupid to waste resources fighting it! When I see victorious photos in the media of tonnes of cannabis burning I just think what an appalling waste. A wast of ecological capacity, a waste of human resources, a waste of our atmosphere's capacity to absorb pollution, a waste of time, and, of course, a waste of good pot. The fire is a beacon of stupidity and the law enforcers standing around it are simply the guardians of a failed policy and a failed attempt of an elite few to force their limited concept of morality upon the free citizens of the world. As David Simon, writer of The Wire points out, the war on drugs is actually “nothing more or less than a war on our underclass”. If we want to tackle the deficit, reduce crime, free up police time, shift a step towards a rational and fair society, respect people's human rights and allow natural plants to grow without labelling them 'illegal', we should legalize all drugs now. The arguments for ending prohibition have now grown so strong that disagreement is a simply a bold statement of idiocy. The right wing media and the politicians and commentators that want to maintain prohibition need to wake up and smell the coffee. When they rejoin the real world they will see that drugs have always been with us and always will be; that banning them causes immeasurable harm and pain and that legalization and regulation brings a huge chunk of the black market into the economy to the benefit of all citizens.